He was in charge of a congregation, and the work was challenging. He needed help, support and knowledge if he was to serve God’s people effectively. Fortunately, he had Paul to help him. It was — and is — good advice. But that word study. Study what? Study how? Study when? Timothy had Paul. Whom do you have? Perhaps ACCM can help you. ACCM stands for Ambassador College of Christian Ministry. You may have seen our advertisements in this magazine. We’d like to tell you more about it. In the life of the church, ministry best happens in supportive collaboration. The ACCM Diploma program is more vocational than academic. It’s about doing ministry. It’s practical. Many elders, lay pastors, pastoral teams and active members haven’t had formal education in theology and biblical studies, so we have worked hard to create friendly, accessible grounding in practical, real-world Christian ministry. Scores of Christian congregations remain viable in today’s changing world thanks to God’s grace…and the generous, selfless work of people stepping up to the plate and filling ministry needs. Volunteers of all ages and circumstances provide the people-power through which God works, and ACCM is there to help equip them for service. Every assignment, every piece of class work and every exercise is crafted to be usable in the real-world service of the spiritual communities in which our students live and share the gospel. We intend that ACCM students are all contributors in the fellowship, however their gifting allows. Their class work is intended to provide beneficial help “in the trenches” for their pastors. For the Pastoral Care course, for example, we consult with the student’s pastoral supervisor in order to apply and adapt our assessment criteria into individually appropriate major assignments that reflect realistic conditions where they live. We deeply appreciate this collaboration and opportunity to integrate our courses authentically into denominational life. While not all the students completing Pastoral Care are actually involved directly in pastoral care (although about half of them are), they all experience “a day in the life” — a chance to appreciate the pastor’s role, some of the pressures and perhaps how their own contribution might best support the edifying of the Body in love (Ephesians 4:16). Remember, this is vocational more than academic. In the life of the church, ministry best happens in collaboration — multitudes of counsel, supported by a network of faithful colleagues and mentors willing to help us better serve God’s precious children. That’s how we plan our course work and assessments. Students can ask, discuss, and touch up their work as often as they want. How well they do in the course isn’t decided in a single exam. Why should it? That’s not how healthy Christian life works. Nobody benefits from failure, so we’ve simply eliminated that possibility. Not in a wishy-washy manner that would devalue an ACCM Diploma; rather, we collaborate with and mentor our students for as long as it takes to help them succeed. Q&A, email support, time extensions or just plain personal contact: our purpose is to help our students succeed. When they do, we do! Pastoral Care is primarily about a state of the heart, demonstrated consistently over the period of the course, while acquiring basic pastoral care skills. We’re attempting to reflect the grace approach in the course experience. We work with you in a way that encourages: openness to advice and instruction — a distinct absence of “I know it all”; clear willingness to discuss and share with fellow students as “workers together with him” (2 Corinthians 6:1); readiness, within reasonable bounds of privacy, to discuss with fellow students one’s strengths and shortcomings — the challenges for them in ministry; evidence of real-world consultation with and consideration for the people being served and a heart of love for the redeemed community into which God has placed them. We’re confident that this would please the Master. It’s certainly pleasing a growing number of pastoral care colleagues worldwide who first shared their experiences and challenges in course discussion forums. If you can relate to what you’ve read here, maybe you’d like to consider signing up for the Diploma Program, too. All our courses are available online for $150 — just enough to cover our administrative costs. Another student successfully crossed the line last week with the help of ACCM, his pastoral supervisor and some newfound, ongoing pastoral care colleagues. 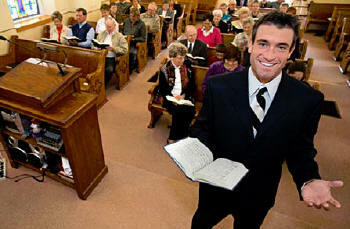 I find that exciting and encouraging for both the congregation blessed to have him to serve among them. If you would like to know more, check us out on the web at:www.ambascol.org You’ll find everything you need to get started in the menu.